This weekend’s (Sept. 21) Americana Music Festival and Conference marked the beginning of a unique educational partnership between the festival’s organizer, the Americana Music Association, and MTSU’s College of Mass Communication. The collaboration between MTSU and the association, based in Franklin, Tenn., will bring special learning opportunities to students pursuing careers in music, said Mass Communication Dean Ken Paulson. Under the partnership, prominent artists will participate in special lectures at the university. Students also got to attend the Americana Music Festival and Conference, which ran this year from Wednesday to Sunday in Nashville, featured about 130 live performances at six music venues. 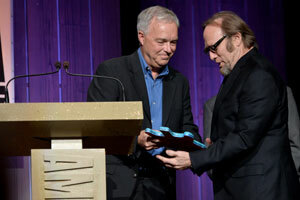 As part of the festival, Paulson presented the Spirit of Americana Freedom of Speech Award on Wednesday (Sept. 18) to artist Stephen Stills during the Honors & Awards Show at Ryman Auditorium. The award was given by the association and the Freedom Forum’s First Amendment Center. The award spotlights and celebrates Stills’ contributions to some of the most thought-provoking and observational songs of the 60s and 70s, as a member of Crosby, Stills, Nash & Young and beyond. Among them; “For What It’s Worth,” “Wooden Ships,” and “The Ecology Song.” Students also got to hear from British singer-songwriter Billy Bragg on Thursday (Sept. 19). He was the inaugural guest speaker for the new Americana Music series at MTSU. Jed Hilly, executive director of the Americana Music Association, said the partnership is a logical extension of the association’s overall mission.